Hello! 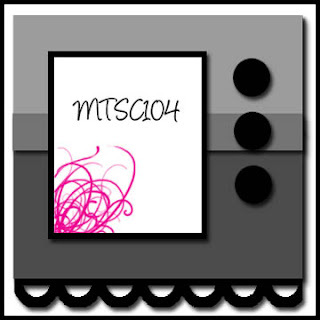 I'm here with my card for Sparkle Creations Rubber Stamps Challenge #23 and Mercy's Tuesday Sketch Challenge, MTSC104. If you recall last week, I made a boo boo and ended up having to make 2 separate cards.. well, I almost did it again this week, but luckily the SCRSC23 challenge is to use stitching and I did that automatically.. phew! Thanks to all of you who played along in the SCRS challenge last week! This week will be the final challenge for 2010. Sparkle is giving her designers and fans the rest of the year off from challenges.. We will be back on January 4 with an all new challenge at this time (9 PM PST on Mondays). Sparkle is sponsoring a few challenges this month, so be sure to keep visiting the SCRS blog. As I mentioned above, this week's challenge is to use stitching (faux or real). I am still working on Christmas cards.. I think I have enough for this year, but I'm still making them since they are one of my favorite types of cards to make. I used Sledding Chloe today. I die cut only a portion of the image.. doesn't it look like she and her reindeer are having a great time? For more SCRS inspiration and details, please visit the SCRS blog to see the design team's wonderful creations and their individual blogs for more details. I'd like to say a big thank you to Suzanne Czosek for her wonderful creations and for being such a fabulous Guest Designer! Be sure to keep visiting her.. I think she just might have more Sparkle Creations to show you this month. 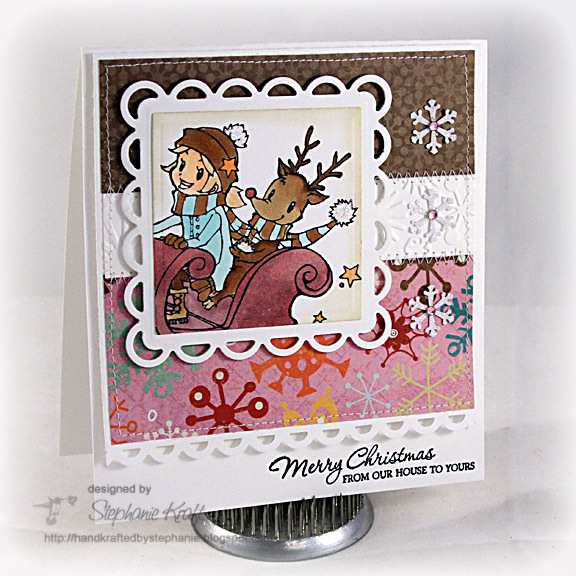 Suzanne Czosek, December Guest Designer! Accessories: Square and Lacey Squares Nestabilities (Spellbinders), Apron Lace border punch (Fiskars), Snowflake punch (EK Success), Snowflake embossing folder (Provo Craft), Markers, Spica glitter pen (Copic); Rhinestones (Kaisercraft), Star Dust Stickles (Ranger), Foam tape, Thread, Sewing machine. Adorable!!!! Love the different papers and the image is so cute!!! Such a darling card! I love those colors! Love the colors!!! The combination is beautiful. The image being captured in the corner really showcases how much fun they are having. Love your fun Christmas card! Great non-traditional colors! Super cute card Stephanie! Love that lil' reindeer wearing the scarf! This is a fun card! I left you something on my blog today. WWOW!!! Amazing card Steph! I really love how you cut part of the image off, I love that look! I love the cute image Stephanie, love the papers...so cute! Love this beautiful bright Christmas card! It really reminds me of a bright snow day!